Fabulous Flyers :: Well priced, great feel, these needles FLY! Nickel-plated brass with acrylic cables, smooth joins, well finished tips. 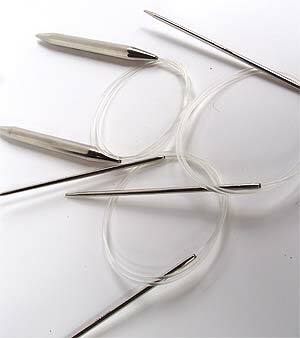 Fabulous flyers metal circular knitting needles let your fingers fly faster. Nickel-plated brass metal circular knitting needles with smooth acrylic cables and a nice, smooth join, as well as a new finish that improves upon our prior product. Ok, I admit it. I'm a wood snob. 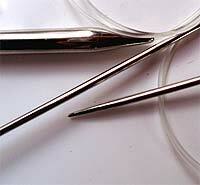 But when I tried these wonderful nickel-plated brass knitting needles, my knitting rocked. Faster than a speeding bullet. Able to knit rib stitch in half the time!